I love Vienna Almonds. In the basement of the Queen Victoria Building, sweet caramelised nuts can be smelt by people walking to or from Town Hall station. I am very tempted every time I walk by there to pick up some of their tasty macadamia, cashews or almonds coated in lovely caramel. Other little stalls used to make Vienna almonds around Christmas, but I can no longer find any of them set up, so if you’re not able to get your hands on some… make them yourself. These are not too hard to make (I say after only succeeding on my third try – this was years ago now, and I had no sugar thermometer). I tended to lack a bit of patience with some things and waiting for sugar water to caramelize and turn golden is a bit scary. I thought it was changing colour a lot earlier than it was and then the whole thing was stuffed up – the almonds were left coated in chunks of sugar (let me know if you want to see my failed attempts). 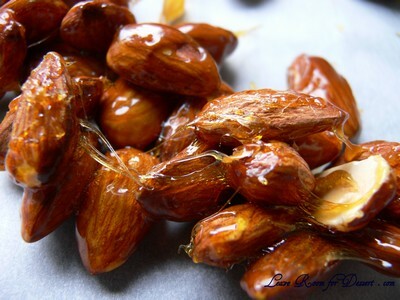 I also found if I hadn’t roasted the almonds, the extra moisture or oils would also cause havoc with the caramel. They taste great by themselves or incorporated in desserts (see my next recipe…). I’m sure you could also use macadamias or cashews in this recipe, it is on my long list of things to make. 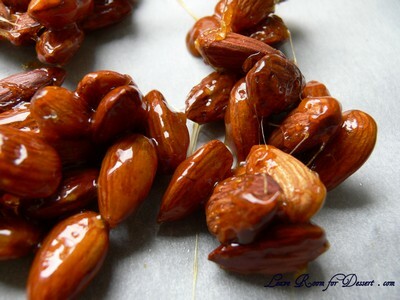 Roast the almonds in the oven for 15 minutes to remove the oil and add some colour to it. The oil will prevent the caramel from sticking to the almonds, so, the oil should be removed by roasting it, or blanching it. Cook sugar, water and vanilla beans without stirring to about 124°C. that should be when the colour is slowly turning to golden brown. Be careful not to burn it. 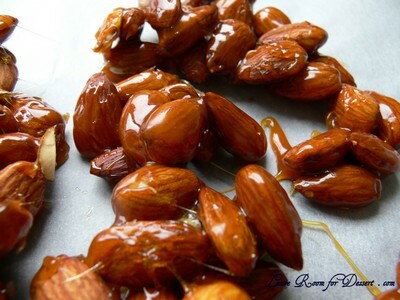 Then add in the almonds and then stir so that the almonds are well coated with caramel. Stir in butter. Pour out onto oiled surface or baking paper and separate them. Filed under Recipes. You can follow any responses to this entry through the RSS 2.0 feed. You can leave a response, or trackback from your own site. Wow, they look delicious!! I would like some whilst sitting and watching TV!! Oh, I can’t believe it! I love Vienna Almonds. When I was little we could get big jars of them at Christmas and I so looked forward to them. Now, it is very hard to find them. So, I’m glad to have a recipe. Thank you. Ahha, so you have to roast the almonds first. I think that was my problem. I didn’t measure the temperature either, so mine were a little overdone. It’s nice to have a proper recipe, and I look forward to hearing your next one! They look delicious! I can’t wait to see what you’ll be making with them! Wow, they look great and delicious!!! I love Vienna almonds too and the smells of the QVB nut shop is sooo good, I bought some from it several times and my dad also love their caramelised macadamia. Is the nuts shop still in there, as I haven’t seen it last time I went there, or do anybody know where I can find the shop now? That is an amazing photo!!! I mean anyone reading this must be drooling. Copying the recipe now. My kids will love nibbling on these. I think you could crush them and add them to ice cream, a panna cotta…I can think of lots of things to do with them. Thanks for this recipe, first attempt ended up coated in sugar like yours (I too was scared about overdoing it without a thermometer. Second time round they were delicious. 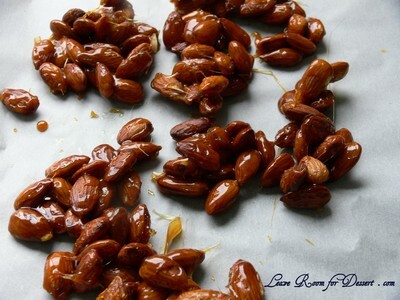 I am just about to go and get the ingredients to make these wonderful nuts, to go with Goats Cheese and Beetroot Salad. I can not wait to try this tonight.